Plant trimming in South Florida can be a steady pastime. 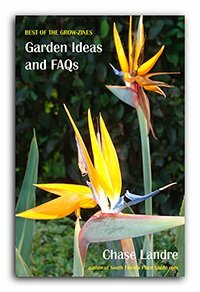 Here are tips on when and how to trim, how much to take off, and ways to keep this garden chore to a minimum. ...whether to keep them the height or shape you want, or to remove dead or dying fronds or leaves. There's trimming and then there's hard pruning. Plant trimming is shaping. This can be done any time of year in South Florida. Hard pruning - cutting back up to one-third to even one-half of a plant - should only be done in warm months...March 15th through October 15th. Always water well before giving a plant a hard pruning. This isn't necessary for shaping, just heavy pruning. Wait at least an hour after watering to start cutting things back. 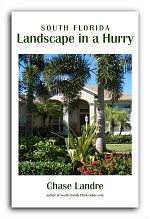 Snowbirds: give your landscape plants a hard pruning just before you leave for the summer. Once a year is fine for pruning most plants. Certain plants like azaleas are best left alone - trim or prune - until after they've finished their blooming season. Cutting back after a bloom cycle on things that flower on and off all year will encourage new growth and more blooms, especially if you fertilize when you cut. ...on shaping or pruning, the growth rate, and the ultimate height or at what height you can keep it. Plant growth rates are classified simply as slow, fast or moderate. And no two plants...even of the same variety...grow at the same pace. There are no definite numbers. A plant's growth rate doesn't indicate it will grow a certain number of inches (or feet) in a year. 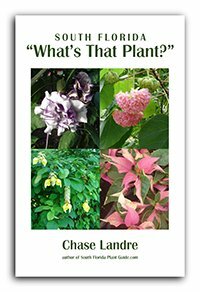 A lot depends on placement, fertilizing and other care - and, of course, Mother Nature. Some plants grow fast for a while and then settle into a more moderate pace. Traveler's Palm, for instance, grows fast until it starts developing a trunk...then its growth rate becomes more moderate. But most keep the same pace all their lives. So how much plant trimming you have to do can depend on whether you use fast growing plants or those that have a slow or moderate rate of growth. Sometimes you want a faster grower for privacy or shade. And if you want instant gratification - especially with a slow grower - buy a bigger, more mature specimen. 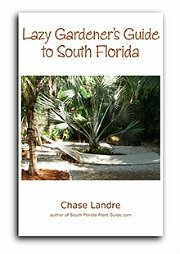 Unless a palm is considered "clustering," sending up many shoots, never cut a palm tree's trunk. The head of a palm is its heart and soul, and if you chop its head off it's a goner. 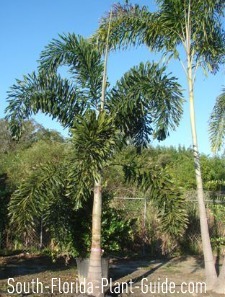 Many multi-trunk palm specimens are considered "solitary," but with 2 or 3 palms planted together. Solitary palms cannot be cut back. Clustering palms like arecas can be thinned out - some trunks cut to the ground while others are left to grow and fill in. Some palms - like the foxtail palm pictured above - are self-cleaning, meaning they'll shed dead fronds on their own. Others will need to have browned fronds cut off. And some will be too tall eventually to do yourself...these palms can be left to sport a "petticoat" of dead fronds around the base of their green tops. The old fronds will fall off on their own eventually, but some petticoat is usually always present. Leaf trimming vs. stem trimming: Some shrubs like viburnum can take a manicured shaping with hedge trimmers. Others, such as junipers, need to be hand trimmed by cutting branches rather than across foliage. Certain shrubs like arboricola look best when stems rather than leaves are cut. And a few like Texas sage benefit from an alternating pruning (cutting some branches taller, others shorter). 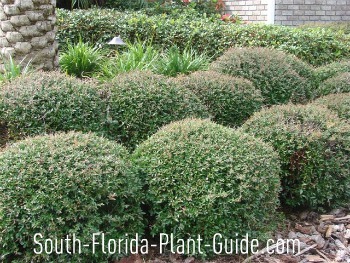 How often and how you go about trimming bushes can depend on the look you want - formal or informal. A more informal landscape doesn't require regular sculpting but rather only cutting to shape now and then - and usually a hard pruning in spring. For larger trees, this is best left to a professional. For smaller, reachable trees such as desert cassia doing it yourself after a bloom cycle (if it even needs it) works fine. Use plants that rarely need shaping. Philodendron, for instance, only needs a dead or dying leaf and stem removed occasionally. 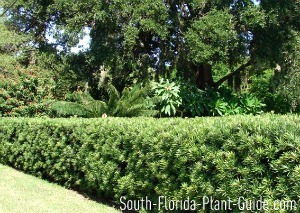 Slow growers like Japanese boxwood or podocarpus need attention less often. Horizontal growth patterns means plants such as junipers grow outward, rather than up. Look for self-cleaning palms such as foxtail and adonidia (Christmas) palm. Space plants so they have room to fill out, rather than competing and reaching for light. 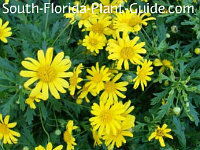 Bush daisy is one plant that will live a longer, healthier life by cutting it back a bit every few months. Lantana, especially the older cultivars, get leggy after a while. Even though they may be full of blooms, cut them back to encourage bushiness and new growth.